Hankin-Evelyn Recreation Area is about 40 minutes from Smithers, in west-central BC. 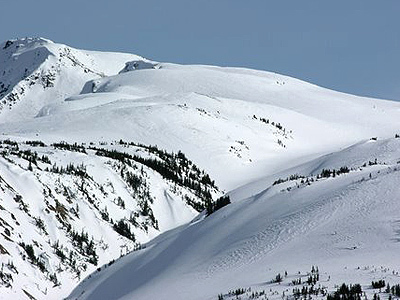 Typical mid-season snowpack at treeline is about 2 m's with estimates of 700 cm accumulated snowfall (about what Lake Louise or Jasper get over two years). Upgrades—including good clear signage and an old fire lookout renovated into a new day-use shelter in the sub-alpine—are on offer so now is a good time to check it out. 6 runs have been cut and there are lots of trails and up-tracks. For the 2010/2011 season, an additional 3 runs open up significant new terrain (some of it closer to town). To get to the area from Smithers, head north on highway 16 for approx 20 minutes then turn left onto Kitseguecla Lake road. Follow the Kitseguecla Lake road for 8 km and turn left onto the 608 road. Follow this for 6 km until you arrive at the rec area parking area. Unlike most backcountry skiing tours mentioned here on the site, the Hankin-Evelyn Recreation Area trails are well marked so it’s relatively easy to get around. All routes also start at the parking lot—which makes life simple. 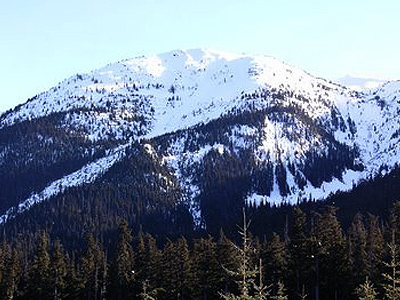 The area is unique in that it is being developed (with funding) as a backcountry skiing area. 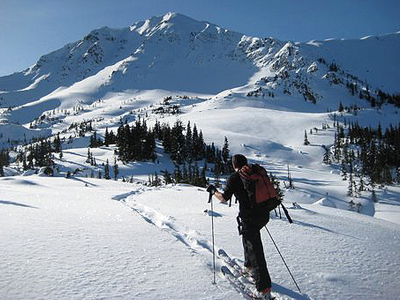 If you are looking for maps and/or directions, drop into the Stork Nest Inn or Valhalla Pure Outfitters in Smithers. We want to hear about your adventures in the Hankin-Evelyn Recreation Area so don’t forget to post a trip report in the backcountryskiingcanada.com forums. 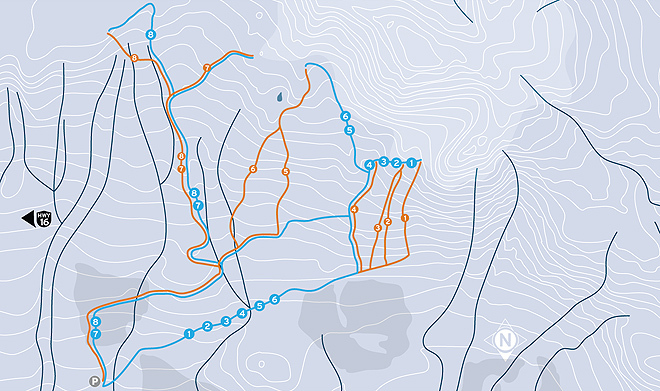 If you have a new route in the area you want to share, mouse-on over here. N-Joy. All routes listed here provided by Brian Hall and Jay Gilden the brains behind the project. If we have missed anything please let us know? #1 is the furthest west of the 1-4 group. The uptrack starts off in the trees at the parking area, then climbs gently through the woods to an mellowish open run descent. Just before you hit #1 at the end of the line, you’ll find #2, a nice and easy quick lap with a descent to the north. Just to the east of #2, you’ll find #3, another fine run off the ridgeline. The first trail you’ll see along the uptrack is number #4. It’s also the most challenging. If you are feeling energetic, you may be able to knock off routes 1-4 all in one day. #5 is slightly longer than the 1-4 group loops and has a greater elevation gain. You can also link up 5 and 6 with 1-4. Just ski down and continue on to the 5 and 6 uptrack. The trails in this area offer both open and treed slopes. Like 5, #6 offers the treed/alpine combo and a slightly longer, more challenging tour. 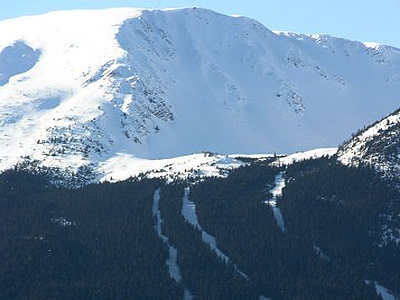 #’s 7 and 8 are on their own within the rec area and feature open bowl skiing for intermediate to advanced skiers. #8 takes you furthest away from the parking lot so think about packing a lunch. The terrain has an ATES rating of 2 so be sure to observe, and respect, the terrain features.